Do the Department of Agriculture’s regulations—requiring that a percentage of raisin crops be “reserved” for the government to use to control supply—constitute a taking necessitating just compensation? This case presents the Supreme Court with the opportunity to clarify what constitutes a taking. The Hornes argue that the Marketing Order, requiring raisin handlers to deliver a reserve portion of a growers’ crop to the government, constitutes a categorical taking under the Fifth Amendment. The Department of Agriculture, on the other hand, argues that the reserve requirement is simply a time-use limitation that is lawful and does not require just compensation under the Fifth Amendment. This case will have important implications for property owners generally, and will affect the government’s options regarding how to regulate agriculture in ways to protect producers and consumers. Whether the government's “categorical duty” under the Fifth Amendment to pay just compensation when it “physically takes possession of an interest in property,” Arkansas Game & Fish Comm’n v. United States, 133 S. Ct. 511, 518 (2012), applies only to real property and not to personal property. Whether the government may avoid the categorical duty to pay just compensation for a physical taking of property by reserving to the property owner a contingent interest in a portion of the value of the property, set at the government’s discretion. Whether a governmental mandate to relinquish specific, identifiable property as a “condition” on permission to engage in commerce effects a per se taking. Re. Banning Dinesh D’Souza’s latest bestselling book, "America: Imagine the World Without Her," from your stores. The Unalienable Rights Foundation supports the right of any business to make policy decisions that either affect their internal controls or their customer base. That said, this latest decision to selectively ban a particular book from your inventory does a disservice to your customers insofar as the inconvenience, and secondly, the thought of supporting a business that by this one action, violates the great principles established by our Bill of Rights and its First Amendment. But that is your decision, and while we may disagree with your company’s philosophy, our philosophy says we have the option to vote with our feet and wallets. We will continue to urge our membership and supporters to boycott your stores as you elected to violate the American standard of its people redressing their government for grievances they have against their government in a peaceful manner via petitioning the government in the written expression of speech in a book written by one of those granted that right by the Constitution. It is written: - Congress shall make no law respecting an establishment of religion, or prohibiting the free exercise thereof; or abridging the freedom of speech, or of the press; or the right of the people peaceably to assemble, and to petition the government for a redress of grievances. U.S. Constitution U.S. Con. 1st Amd. (1791). [t]o exercise state-protected rights of free expression and petition on shopping center property does not amount to an unconstitutional infringement of appellants' property rights under the Taking Clause of the Fifth Amendment, appellants having failed to demonstrate that the "right to exclude others" is so essential to the use or economic value of their property that the state-authorized limitation of it amounted to a "taking." Kaiser Aetna v. United States, 444 U.S. 164, distinguished. And there is no merit to appellants' argument that they have been denied property without due process of law, where they have failed to show that the due process test whereby the challenged law must not be unreasonable, arbitrary, or capricious and the means selected must have a real and substantial relation to the objective to be obtained, is not satisfied by the State's asserted interest in promoting more expansive rights of free speech and petition than conferred by the Federal Constitution. Pp. 82-85. *Disclaimers:  Regarding Electronic Signature: If this communication concern negotiation of a contract or agreement, electronic signature rules do not apply to this communication:  contract formation in this matter shall occur only with manually-affixed original signatures on original documents. No negotiations respecting any item, such as talking about that/any item(s) or securing estimates for same shall not in any way obligate UARF of its staff to that item discussed, nor shall UARF or its STAFF be held liable for any damage(s) for failure not to include/honor the same unless obligated to do so by the terms set forth in a contract negotiated by the parties with the aforesaid manually affixed signatures. The Signature given hereon is not an electronic signature and is provided only for the purposes of providing information and for no other purpose(s) whatsoever. Any government entity / agency / employee / agent / contractor in receipt of this email is to consider this e-mail written under the rights granted to UARF and the sender under the umbrella of  the Constitution of the United States,  its 14th amendment, [2.A.] 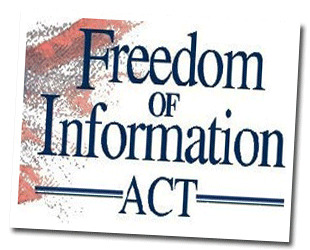 the Federal Freedom of Information Act (Enacted on July 4, 1966), [2.B.] Federal Whistle Blower Acts, by whatever names they might be called,  Virginia's Constitution,  The Virginia Freedom of information Act (VA. CODE Sec. 2.2-3700 to 2.2-3714), and  The Virginia Public Records Act (VA. CODE Sec. 42.1-76 to 42.1-91.1). In your response please be sure to preserve your rights as stated/provided for in the 5th. amendment to the U.S. Constitution and Art. 1, Sec. 8 of the Virginia Constitution. The foregoing comments are copyright (C) MMV - MMXIV UARF and may not be copied, redistributed, extracted from, or recirculated outside of this mailing without written consent by URAF. The information herein contained is for informational purposes only and is not the expression of an professional opinion and should not be used as such. This communication is intended for the sole use of the individual to whom it is addressed and may contain information that is privileged, confidential and exempt from disclosure under applicable law. If the reader of this communication is not the intended recipient or the employee or agent for delivering the communication to the intended recipient, you are hereby notified that any dissemination, distribution, or copying of this communication may be strictly prohibited. If you have received this communication in error, please notify the sender immediately by telephone call, and return the above via United States Postal Service. Over the past two days, a number of press reports have created a controversy surrounding Costco's decision to pull from sale the book, "America, Imagine a World Without Her", a controversy that we believe is completely unwarranted. Unfortunately, in this time of extreme views…both left and right of the "political aisle"…such controversy has been exacerbated, in part due to the portrayal by some, of the facts surrounding the Company's decision to pull this book from sale. The book in question was brought into 249 Costco locations throughout the United States on or about June 1. Sales during the month of June and into the first few days of July, totaled 3,753 units, or approximately 15 books per Costco location. Consistent with the policy of our book department for thirty years, and based solely on the small number of copies sold during the four-to-five week period, our buyer, on July 1, communicated to the warehouse locations that the book be pulled from sale, and returned to the distributor by July 15. Costco is not a book store. Our book shelf space is very limited. We exercise discipline in the best utilization of that limited space based solely on what our members are buying. We can't carry every title that our members are interested in reading. We are constantly monitoring book sales, and make decisions to pull books off the shelves frequently based on sales volume to make room for other titles. Politics, or controversy over content, do not influence our decisions. Politics, or political controversy over content, do not influence our decision to sell, or not sell, a given book. Costco does not make contributions to political candidates or parties…left, center, right or other…period! Costco does not have a political action committee. The political views of Costco's senior management team, Costco's Board of Directors, and Costco's more than 127,000 U.S. employees are varied, and span the entire range of views. While the two company policies mentioned above are clear and unambiguous, we live in America; and we respect the rights of each and every individual to personally support whatever views he or she may have; but we will not allow political beliefs to affect the products we choose to sell. Some have suggested that Costco timed the pulling from sale the book in question to align with the July 2 opening of the book's companion movie. This is unequivocally not true. The book was brought in to Costco to sell. It didn't sell well. In retrospect, we probably should have waited for the movie to be released to see what sales impact it would have. Given yesterday's dramatic sales increase in the book - perhaps due in part to the surrounding controversy - we have chosen to bring back the book. Costco prides itself in the trust and member loyalty earned over the past thirty years. Costco is also proud that our more than 127,000 U.S. employees, and 189,000 employees worldwide, are the best in retail, and are able to earn wages and benefits that far exceed every other major hourly retailer. Some in the press will continue to "fan the flames." That's what they do. At Costco, we have earned our members' and our employees' trust over the past thirty years by bringing to our members the best quality goods and services at the lowest possible prices; by taking care of our employees; and by being principled and doing what is right. We will continue operating our business in this way. It's what makes us who we are. Please click here to register online for the 2014 Supreme Court Round Up. You can also choose to pay at the door by completing your registration online. Please include the names of all registrants. Please click here to register online for the 2011 Supreme Court Round Up. You can also choose to pay at the door by completing your registration online. Please include the names of all registrants. A defendant is subject to the highest mandatory minimum specified for his conduct in §924(c), unless another provision of law directed to conduct proscribed by §924(c) imposes an even greater mandatory minimum. Pp. 5–18. Is There Such a Thing as a Judicial Taking? The Robert's Court action clearly indicates there is and clearly says the Supreme Court is not conservative at all. The Lessons of the Supreme Court’s Ruling in Stop the Beachfront Renourishment, Inc. v. Florida Department of Environmental Protection, et al. The 2010 United States Supreme Court decision in Stop the Beach Renourishment v. Florida Dept. of Environmental Protection, et al. In this matter, the Florida Supreme Court was accused of invoking "nonexistent rules of state substantive law" to reverse 100 years of uniform holdings that littoral rights are constitutionally protected - while the Supreme Court unanimously rejected this argument, what questions remain open for debate as a result of the decision? Can a state Supreme Court cause a "judicial taking" proscribed by the U.S. Constitution? Is a property owner entitled to due process before a state court materially changes its common law of property? Are there constitutional limits on a state's authority to restore stormeroded beaches? The Court will address whether the National Childhood Vaccine Injury Act, or NCVIA, bars personal injury claims based on design defects of a vaccine. In the case of Bruesewitz v. Wyeth, No. 09-152, the parents of a Pittsburgh girl claim that their daughter developed a seizure disorder from a vaccine she received at six-months old. The circuit court of appeals held that the lawsuit was foreclosed by the NCVIA. The Supreme Court’s decision could significantly impact the pharmaceutical industry’s exposure to civil liability. In the consolidated cases of Arizona Christian School Tuition Org. v. Winn, No. 09-987 and Garriott v. Winn, No. 09-991, the Court will consider an Arizona law that provides dollar-for-dollar tax credits for donations to school tuition groups. Because many religious schools run the school tuition groups and award the scholarships on condition that the recipients attend a religious school, certain residents contend the system encourages taxpayers to make donations to religious, as opposed to nonreligious, organizations. The Court may determine whether the effects of the Arizona system constitute a violation of the First Amendment, although the Court must first determine whether the taxpayers have the right to challenge a state program that does not involve the spending of any tax dollars. In Sossamon v. Texas, No. 08-1438, the Court will determine whether an individual may sue a state or state official for damages under the Religious Land Use and Institutionalized Person Act, or RLUIPA. Prisoner Harvey Sossamon filed a lawsuit against the state of Texas and a prison warden, claiming that he was denied access to a prison chapel in violation of RLUIPA. The Court will resolve a split among the circuit courts of appeals concerning whether a state prisoner may file an action under the federal RLUIPA law. In Costco Wholesale Corp. v. Omega, S.A., No. 08-1423, the Court will examine the applicability of the “first sale doctrine” of the Copyright Act to imported goods. Under the “first sale doctrine” of Section 109(a) of the Copyright Act, a purchaser of certain copyrighted material may transfer goods without obtaining permission of the original copyright holder. Costco purchased Swiss-made Omega watches from foreign distributors, and then resold these goods at a below-market price in the United States. Omega claimed that its watches, which have a small copyrighted logo, are protected by Section 602(a) of the Copyright Act, which bans importation of copyrighted works without the owner’s permission. The Court’s decision could have far reaching effects on secondary markets of copyrighted goods, such as eBay and Amazon. Editor's note: Of all the cases before the court this is one in MHO is total bull. The mere sale of the watches in the instant matter by Omega to a distributor was on its face consent for the distributor to sell the goods for after all that is what a distributor does. There was an implied warrant by Omega - Fitness for particular purpose. — Where the seller at the time of contracting has reason to know any particular purpose for which the goods are required and that the buyer is relying on the seller's skill or judgment to select or furnish suitable goods, an implied warranty that the goods shall be fit for such purpose. In this matter goods for resale in a foreign market.